Music criticism can be just another form of consumer advice: like it, stream it, buy it. ( Or don’t, for X number of reasons.) Yet ever since pop music criticism first entered the media mainstream – when Robert Christgau started writing his column in Esquire magazine in 1968 – it has played a wider role, too. Rather than a decree with a numerical score attached, this kind of criticism functions more like travel notes. A conversation, even a form of seduction. I encourage my students to address not just the technical particularities of a song or album but also the experience of hearing it: art is measured not just by the space it takes up but by the air it moves. It is important that a critic know some things about music (history, theory, social utility), and, as with any journalistic pursuit, additional research to bolster that knowledge is paramount. 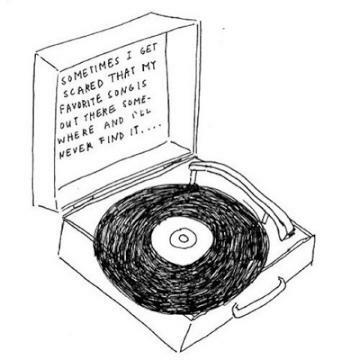 But writers also need to know what they think about a record—how it moves them. Agreed: the text isn’t everything, or the main thing Similarly, the feelings that music inspires aren’t always the best path to understanding how it has done so. Distance can make the heart grow fonder and the mind better able to interrogate one’s responses. Trouble is, the reaction time available is getting shorter and shorter. In essence, Petrusich’s New Yorker article was about the role of criticism in this age of surprise releases that call for instant evaluation. To strain a metaphor, music criticism has become a lot like speed dating. No longer do critics have the time to get acquainted with an album before deciding whether and why it qualifies as a “10.” In her essay, Petrusich provides a good counter-example, from the 1970s. Lester Bangs, she points out, waited ten years before finally sitting down to figure out what he really thought about Van Morrison’s Astral Weeks album. 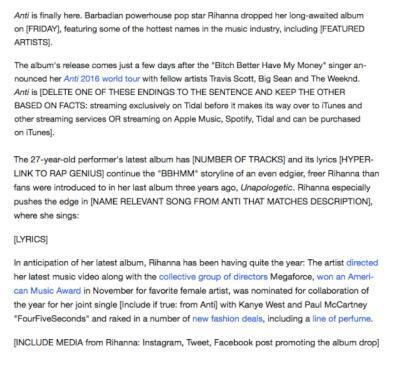 Maybe that’s why Rihanna’s experimentally diverse Anti album was greeted with so many mixed, and confused, responses. The merits of Anti have taken quite a while to sink in, partly because it didn’t instantly fit the expected mould of super-diva albums. Reviewers tried make it fit, regardless ; and then blamed her for not meeting their pre-conditions. Others were all too willing to be accomodating. 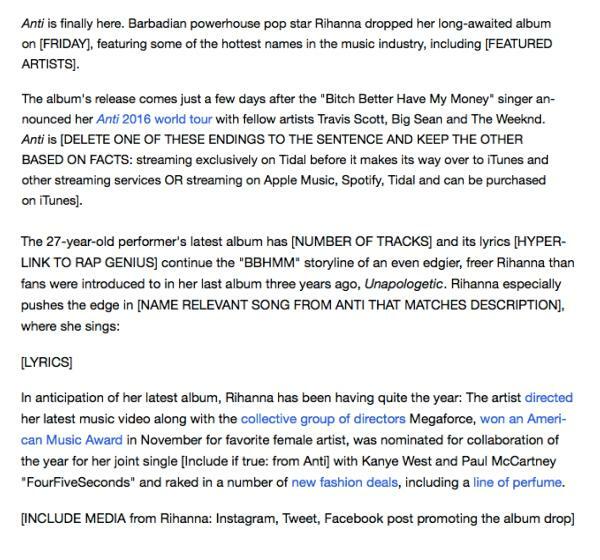 Yahoo, for instance, accidentally published this review template, even before the Anti album got released. The pressure to come up with an insta-reaction is compounded by two other factors. 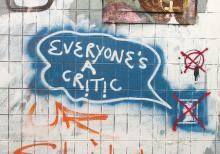 Everyone is a critic now, and more and more people are streaming music, and not buying it. Streaming has advantages, but it works against one major consequence of buying an album. Formerly, the act of purchase forged a commitment conducive to a long term relationship, and to the continuous process of discovery this entails. Track eight, initially overlooked, may reveal its secrets, given the time. As yet, I don’t think anyone has established the impact that streaming is having on the way music is being made, consumed and critiqued. Yes, we now have more options, but the downside is like Tinder. An excess of options is being pursued more narrowly, and more contingently. Don’t get me wrong. This isn’t a lament for the bygone days when the record-buying public would sit respectfully at the foot of some music critic sage, awaiting orders. Moreover, it everyone can (for free) get some advance idea of what every artist on the planet sounds like. That’s a vast improvement. Back in the worst days of record industry over-pricing, you either had to plunk down $35 for a CD to find out, or rely on some critic that you’d come to trust. It should never have been so risky. Ultimately, the record industry had only itself to blame when its customers – burned by too many $35 misfires – finally took their discretionary dollar elsewhere. Sure, a few music writers (and we know who they are) still seem to regard their gut response as a revelation of cosmic truth. But those days are over and done. No response is forbidden. As Carl Wilson taught us, the categories of bad music/good music are mere social constructs, and not universal truths. So…pull up a chair, buddy, and lets share some random thoughts about William Tyler. Tyler is a solo guitarist (acoustic and electric) from Nashville, Tennessee and he comes with a good pedigree: He used to play with the alt-country band Lambchop, and with the Silver Jews. I’m picked him as the subject of this column because (a) he’s got a new album out on June 3rd, called Modern Country and (b) he’s an instrumentalist. Problem: how do you write about popular music when there are no lyrics on which to hang the autobiographical premises that so much criticism relies upon? Its easy to see why people fall back on clichés like “ atmospheric” or amazing riff on track three” and “Hey, that bitchin’ solo on track six” etc etc. It is harder to convey why someone like Tyler is worth your time than it is say, with a vocalist steeped in the same ( dirt poor) geographic region of the South. In just over two minutes, this clip of the late Gary Stewart for instance, tells us all we need to know about the workings of poverty, alcohol and sin. I’ve tried to write about Gary Stewart before. The point of mentioning him here is by way of contrast with Tyler, whose instrumental music draws directly from the same swathe of Kentucky and Tennessee social landscape that produced Stewart, and buried him. Take a listen to this live version of an early track by Tyler, from his Behold The Spirit debut album. What else? Well, you can trace the technique is Piedmont blues & to the Merle Travis finger picking styles that “Missionary Ridge” & its execution so nimbly evoke. For some, one drawback will be Tyler’a obvious relationship ( on this track at least) to other guitarists who have already worked the same territory, starting with the“ Takoma School” of acoustic musicians headed by John Fahey and Robbie Basho. The work of these 1960s/1970s pioneers is being carried out – and extended – by the modern likes of Tyler, Steve Gunn and Glenn Jones. Exactly. The melodies on Tyler more recent albums unfold like pop songs, not folk songs. Another recurring point of divergence from the Takoma crew is the socio-political context to which Tyler consciously refers. The title of “ Cadillac Desert” for instance, is taken from Marc Reisner’s book about America’s looming water shortage apocalypse. Fittingly, the melody opens up into a Big Sky vastness, but one shot through with a hollow, palpable sense of dread. (No lyrics, but you can feel the bad times a-coming.) “Portrait of Sarah” on the other hand, is a beautifully delicate melody dedicated to his girlfriend Sarah Souther, the ex-wife of songwriter J.D. Souther. Even so, the video pay an extended tribute to the 1970s existential classic Two Lane Black Top, with Tyler in the James Taylor role. According to Tyler, the opening track (“Highway Anxiety”) on his new album was a by-product of driving alone along the hundreds of miles between gigs. Apparently, those endless stretches of highway induced a series of panic attacks. (If Mark Kozelek hadn’t got there first, the track could’ve been called “The Ghosts of the Great Highway.”) This next track “Gone Clear” is also from the new album Modern Country due out, as mentioned, on June 3rd. The album title refers ironically to what’s gone off kilter in the socio-geographical landscape… and with America’s sense of self-regard. The modern country isn’t in good shape. In conclusion… here’s an entire William Tyler concert from 2015. It kicks off with yet another version of “Missionary Ridge” but the highlight comes when he picks up the electric guitar to play“ Highway Anxiety”… those tremolo effects may be a long way from John Fahey, but they’re used to much the same ends. Traditionally, American musicians would salve their suffering by getting in the car and driving…somewhere, anywhere, across the great wide open. In that respect, freedom’s just another word for getting behind the wheel. But not any more. Driving onwards across America (or into the past) is now just anxiety-inducing. Footnote: Since life doesn’t offer many opportunities to mention Gary Stewart… one of his B-sides (called “Honky Tonk Man”) is one of the more extreme examples of artistic self-loathing ever committed to record. Vibrato gone haywire, lyrics slurred to intelligibility, this track conveys music-as-a- career misgivings that are as bad as any that Hank Williams ever felt.